Few people in the world have as an impressive travel resume as Omar Samra. This global adventurer has seen, visited, and trekked through some of the world’s most remote and exotic locations. Samra shares this wanderlust through his company, Wild Guanabana, which organises exciting trips in Egypt and around the world. In this eniGma exclusive, Samra tells us about his next breathtaking adventure. My core philosophy is centered on the belief that the world is an incredible place worth exploring and discovering, and that’s the message I’ve been trying to convey through Wild Guanabana. By removing ourselves from the distractions of everyday life and taking on new and challenging experiences, we grow and learn more about ourselves and the world in ways we never thought possible. At Wild Guanabana, we fondly think of ourselves as a platform for the unfolding of life changing journeys. Nothing is more fulfilling to us than creating and sharing these experiences with others. I personally lead several trips in Egypt and abroad every year, and I enjoy each one as if it was my first. Like all our trips, this next trip caters to anyone with a passion for self discovery. This May, I will lead a group on a 10-day Himalayan trekking trip in one of the most remote regions of the Nepalese Himalayas. We will trek through wilderness and a number of small villages. The diversity of this trek is spectacular as it will take our adventurers through the Rhododendron forest and then higher into the white Himalayan vistas and their fantastic lush greenery. As is the case with all our trips, most of those who will be joining us on this journey have never been on an adventure trip in their lifetime. To make the experience more authentic, participants on this trip will be staying in town and will be housed with local families. This is a great opportunity to truly witness and understand the local culture. Upon arrival to Kathmandu, the capital of Nepal, representatives from Wild Guanabana will brief the group about the trip. 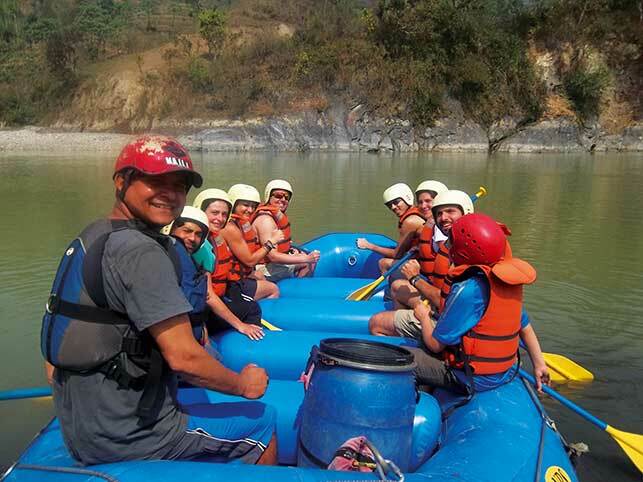 Our team is very passionate, well trained, and is well acquainted with the location in order to offer a first-hand experience and a memorable adventure. As the trip begins, we will trek through the scenic valley until the Tamang settlement of Dunche, 2,030 meters high, to enjoy the views of this picturesque village overnight. On the next day, we will leave the village and follow the trail passing the terraced potato fields, crossing over a small stream, and continue to climb up a steep ascent through lush forests and a cliff for a striking view of the rocky mountain of Gosaikund deep in the valley. Then we will continue on a ridge filled with Rhododendrons to Shing Gompa to visit a small cheese factory and an old Buddhist monastery. On the fourth day, we will follow a steep trail that bridges the rich forests on the northern slopes, which are the sanctuary for the red panda, an endangered species that the Nepalis call cat bear; and will pass by the dry scrub vegetation on the southern slopes. We will reach Chalang Pati, entering the peaceful Goisakund protected area where the killing of animals, lighting wood fires, and grazing goats are prohibited activities. The next day, the trek reaches the largest lake known as Gosainkund Lake (4,460m). The lake has a black rock in the middle, said to be the head of Shiva. Legend has it, Shiva created the lake when he pierced a glacier with his trident to obtain water to quench his thirst after consuming poison. Hundreds of pilgrims come here to worship and bathe during the full-moon festival each August. On this day, Hindu men perform their annual change of Janai, a yellow cotton string worn across the chest or tied around the wrist of the right hand. This cord initiates Hindu pilgrims into manhood and commands them to faithfully follow the religion. The ‘triple cord’ is a symbol of body, speech, and mind, and when the knots are tied the wearer is supposed to gain complete control over each one. On the sixth day, we will skirt the shore of lake Gosainkund before ascending towards the Laurebina Pass (4,610m), passing through roofless stone herders’ huts, crossing several streams and two beautiful waterfalls. We will see overhanging rocks that form a cave used as a campsite by trekkers to see the lights of herders. The trek will continue through a thick pine forest, before the final ascent to Tharepati (3,490m), a grouping of small stone huts used in the summer by herders. Next day we descend to Thare Pati – Kutumasang (2,471m), with magnificent views of the breathtaking Himalayan mountains of Annapurna and Masalsu. On the last day of the trek, we will enjoy the sunrise over the snowcapped mountains, as we start our descent to Chisopani (2,194m), another spectacular view point and which will provide us with an opportunity to explore the tribal culture and mountain lifestyle, before we continue the trail across the Mulkharka and Shivapuri National Park, and finally drive back to Kathmandu.